for your home and yard. Owned by Jake Graber, Jr. Located in the Heart of Amish Country, Credit Cards Accepted. Please call our voicemail for current pricing requests and quotes on custom designs. Come visit our Amish farm and display room. We are open Mon-Saturday, closed on Sunday. 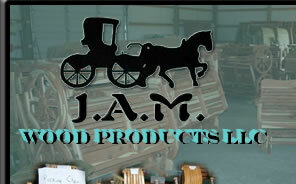 JAM Wood Products is stop #1 on the Amish Country Self-Guided Tour. It's a "must see" on your list of places to visit while in Amish Country. Travel to Jamesport, MO and be sure to stop in, sit in a handcrafted rocker, put your feet up, and step back in time...then have your own piece of quality furniture or sturdy play equipment shipped conveniently to your home! Come see the fine Amish craftmanship that is famous nation wide. 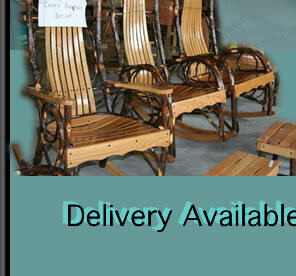 JAM Wood Products, LLC accepts credit cards and delivery is available. Have questions about an item seen on this page? Call and leave a voice message for JAM Wood Products by calling (660) 684-6315.